Home / Blog / How To Identify and Cure Diastasis Recti (DRAM). 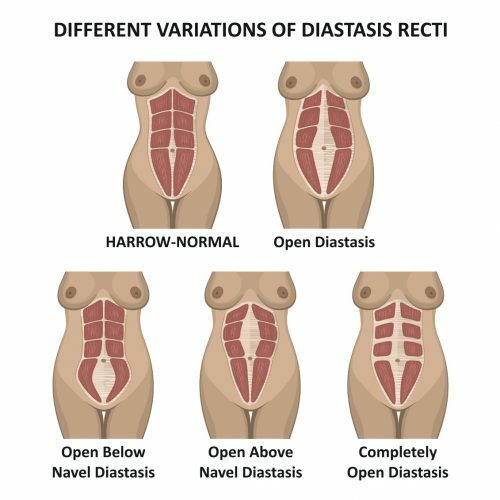 How To Identify and Cure Diastasis Recti (DRAM). A term usually women have never heard of or have no idea about until after having a baby. Diastasis recti is a widening of the abdominal muscles which happens during pregnancy. After birth having a mummy tummy pooch, back pain and weeing on sneezing and exercise usually is due to the presence of a Diastasis Recti and poor muscle control. Diastasis recti. Woman’s abdomen divergence of the muscles of the abdomen after pregnancy and childbirth. It is believed 98-100% of woman experience some degree of Diastasis Recti in the end stages of their pregnancy (Diane Lee 2013). A large majority women with Diastasis Recti will also have pelvic floor muscle dysfunction and the 2 issues tend to be together. Both the problems are treated by the same core deep abdominal muscles and pelvic floor muscle retraining. The Connective Tissue Linea Alba Facts. There is connective tissue connecting the 2 abdominals called the linea alba. When any person does abdominal crunches there is excessive pressure put on this linea alba and then this causes the top and bottom of the abdominal muscles to shorten and the middle portion to bulge out. To start with small microtears in the connective tissue happen with the increased repetitive strain from doing the abdominal crunches and then this can go on to actually causing a muscle separation called the Diastasis Recti. When a woman is pregnant the above is exacerbated as the hormones in pregnancy make the connective tissue even more lax and vulnerable to strain. Then additionally with the growing uterus putting more pressure on the area along with poor core muscle control and nursing positions can lead to a Diastasis Recti during pregnancy. All the muscles of the abdomen including the deep tranversus abdominals, your rectus abdominis (6 pack) and obliques all meet together at this central point called the linea alba. So when this connective tissue is damaged and made thinner and weaker it makes the whole of your body not as strong and stable and the front of the core area of your body being the abdomen unsupported and not stable. The widening of the gap and the weakening of the linea alba connective tissue can happen at different places as the diagram below. How Can I Test To See If I Have A Diastasis Recti? It is best to have a trained physiotherapist experienced in seeing women after birth to test you and confirm the degree of separation and the severity of the damage to your linea alba connective tissue. If you would like to have a go at testing yourself then below is how to try it. Lie on your back on the floor and bend your knees. Then place your 2nd and 3rd fingers together and on the centre of your stomach pointing down towards you belly button. Press down with your finger tips and then lift your head and neck off the floor leaving your shoulders down. If you feel that your fingers go into a gap in any of the areas above and that you can feel the 2 rectus abdominis muscles either side of your fingers that is a Diastasis Recti. Usually a gap that is not wider than 1 or 2 fingers is not of concern but if any wider we recommend seeing a physiotherapist trained in Diastasis Recti correction. If you can press right down into your abdominal cavity then that means the connective tissue has been weakened considerably and there will be little tension that you can feel below the fingers. This tension and strength of the connective tissue can be rebuilt with the right exercise programme and training. What Should I Do If I Have A Diastasis Recti? It is very important to avoid any exercises that cause the crunch bending effect on the abdomen making it bulge out. Avoid just sitting up after birth and instead roll onto your side and then into sitting until your Diastasis Recti has healed. Other exercises such as planks and exercises involving legs straightening such as ab bycicle exercises and lowering legs to the floor from a high position are also to be avoided. Physiotherapists trained in treating Diastasis Recti can start you on a safe programme of specific exercises and progress you to harder exercises gradually which will help the connective tissue to heal and regain its tension improving stability and strength in your body and also help close the Diastasis Recti gap. Should I Wear A Corset Or Have Binding Done? The most important note is to work on increasing your own core strength asap rather than relying on a corset or binding. The muscles described as above once gained strength actually work like your own corset stabilising and supporting your lower back and whole body. Relying to much on a corset or binding can actually stop the muscles from working. In the very early stages after natural birth to provide a feel of support and the first 6 weeks after c section it is ok but we highly recommend kenisology taping after birth to help encourage the healing process and aid tissue remodelling while you strengthen the right muscles around the diastasis recti. How Does Kenisiology Taping Help Correct A Diastasis Recti? We recommend applying the tape soon after birth and having 3 days on wearing the tape and 1 day off for ideally a 6 week period. This tape is proven to help the bodys natural healing process while at the same time providing support and stability to the muscles and joints while you rehabilitate and strengthen them with the exercises. It does not restrict your movement and is latex free so can be worn for days at a time. What Happens In C-Section With Diastasis Recti? In most cases the surgeon will actually sew the 2 muscles back together closing the gap but the linea alba connective tissue will still need to heal properly and regain its full tension therefore the exercises are just as important after C-section as after natural birth. How Can I Get Started On Correcting My Diastasis Recti? Do not leave it too late. It is much harder to correct and takes a lot longer if left more than 8 weeks before starting on a specific rehab programme. Our physiotherapists trained in the specific training can make it easier by coming to you and seeing you at home. We can apply the kinesiology tape also for you at home if you are keen to try this. If you have friends keen to start too then we can also do training for small groups at a location of choice. We can also incorporate toning exercises at the same time as training to correct your Diastasis Recti making you tone up at the same time after birth. Just drop us a whatsapp at +65 8358 2144 or an email to info@health2u.sg and we would love to get you back on track.